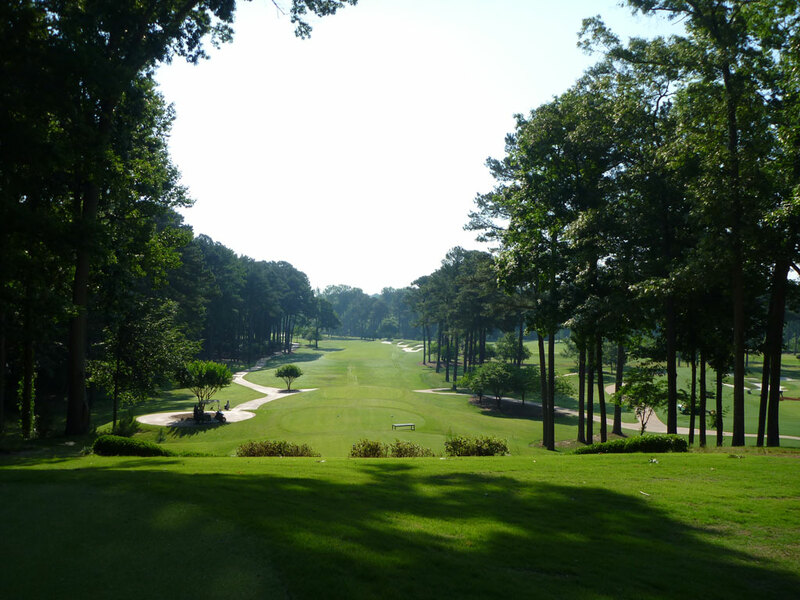 Course Website: Official Website - Visit Atlanta Athletic Club (Highlands)'s official website by clicking on the link provided. Accolades: Ranked 7th in Georgia on Golf Course Gurus' Best in State list. Host of the 1981 (Larry Nelson), 2001 (David Toms), and 2011 (Keegan Bradley) PGA Championships. Host of the 1976 U.S. Open (Jerry Pate). Host of the 1963 Ryder Cup (America 23-9). Host of the 2014 U.S. Amateur (Gunn Yang). 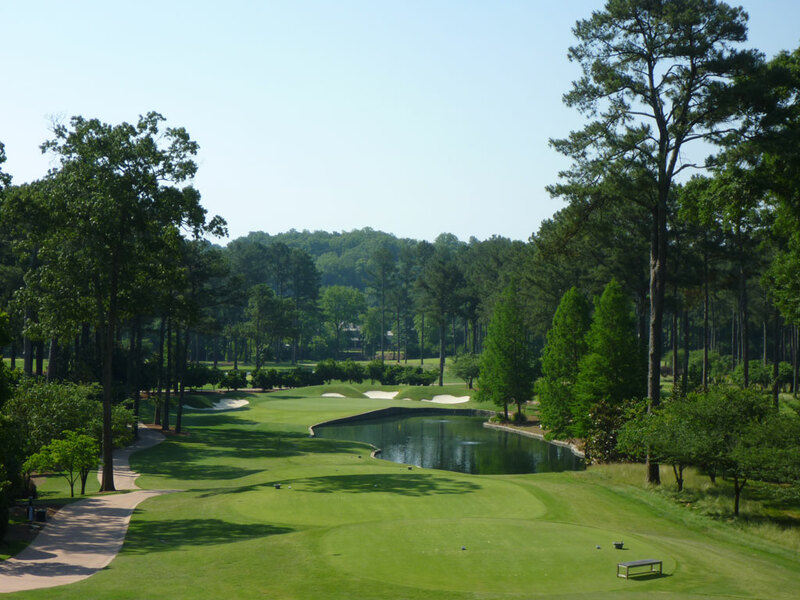 What to Expect: The Atlanta Athletic Club has roots to Bobby Jones when the phenom grew up playing on the East Lake Country Club course and continued to be an active member after the club was moved north to its current Johns Creek location. The club has hosted virtually every significant golfing event including the 1963 Ryder Cup, 1976 U.S. Open, and multiple PGA Championships including 2011. Every par three is lengthy and plays over water that runs right up next to the putting surface. 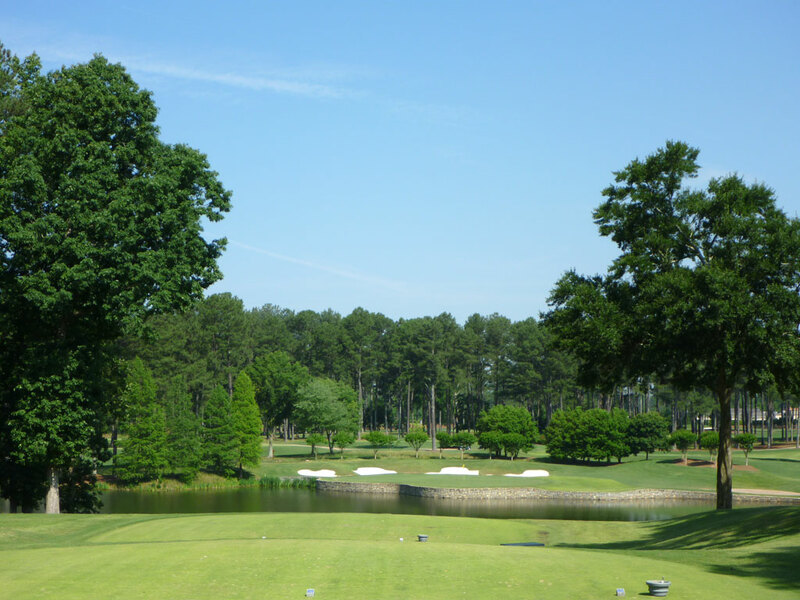 Since the original Robert Trent Jones Sr. layout was installed in the 60s, Rees Jones has made multiple trips to the site remodeling the course in an effort to challenge the world’s best golfers. David Toms made the par three 15th hole famous when his 5-wood tee shot found the bottom of the cup and propelled him to a victory in the 2001 PGA Championship. 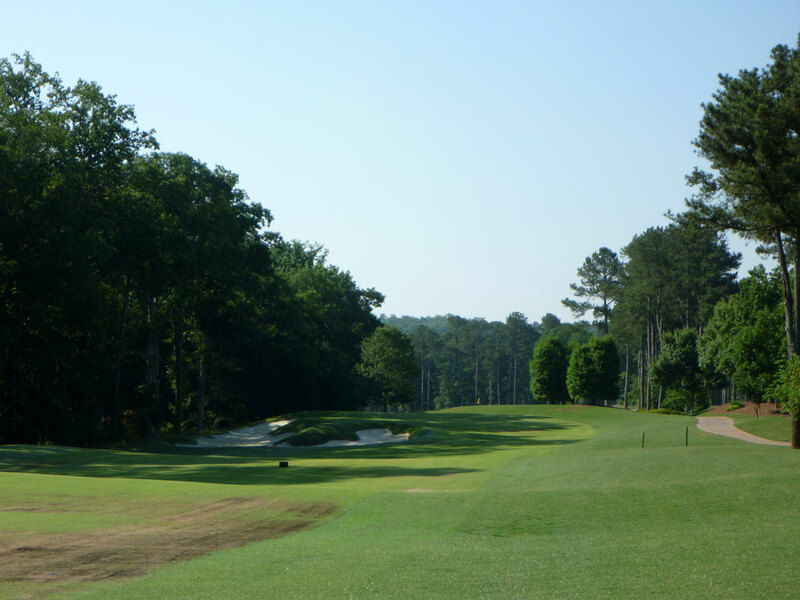 AAC has the unique setup where different grass types are found at each course and thus delivering a unique experience (Diamond Zoysia fairways and Ultra Dwarf Bermuda greens on Highlands and Zion Zoysia fairways and Bentgrass greens on Riverside). If you want to put your skills to the ultimate test then Highlands is awaiting your visit, but if you want a fun course to place bets on with your buddies than Riverside is the call of the day. 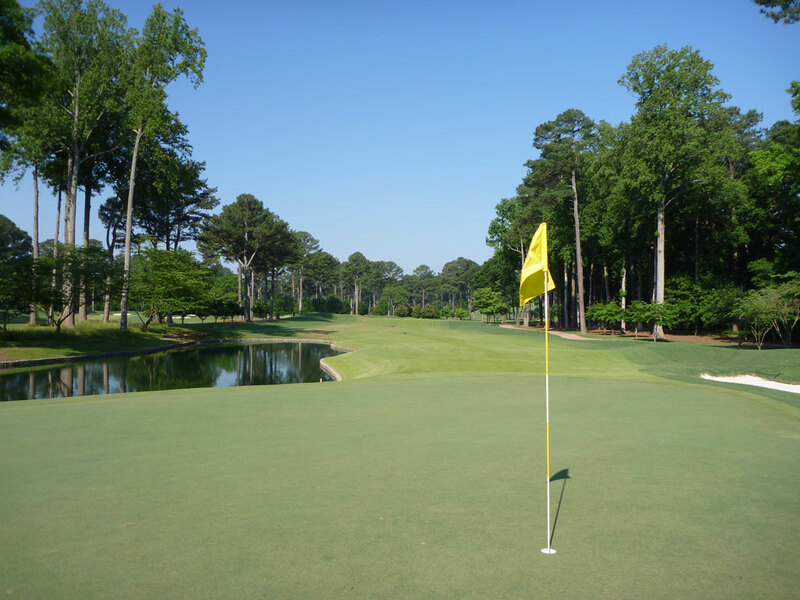 Signature Hole: 15th Hole – 260 Yard Par 3 – This is the hole that David Toms made famous by carding a one on during the Saturday round of the 2001 PGA Championship. For that shot, Toms used a 5 wood to find the bottom of the cup, but that was when it played 30 yards shorter; it can now be stretched out to 260 yards. A pond runs the up the right side of the hole and protects that side of the green. A collection of bunkers hunker across the back of the green while the bail out area sits short left. The elevated tee provides both beauty and drama as you watch your ball sail towards the green hoping it carries the pond. Every par three at the Highlands course is long and plays over water; none more intimidating than the 15th. Best Par 3: 17th Hole – 210 Yards – The last and arguably prettiest par three leaves little room for error as a pond covers the entire front of the hole and comes all the way up to the putting surface with just a rock retaining wall sitting between the green and the H2O. Four bunkers sit behind the green that is wider than it is deep. While the other par threes offer a bail out area, the 17th hole demands a great shot; no exceptions. This impressive one-shotter consistently plays as one of the toughest holes on the course. Best Par 4: 11th Hole – 457 Yards – This demanding par four doglegs hard left about 300 yards off the tee. Bunkers protect each side of the fairway near the turn in the dogleg and should be avoided at all costs if you want to keep par as a reasonable goal. The approach shot play down to a green that is deeper than it is wide and is protected by two ‘U’ shaped bunkers on the left and a pond on the right. The green slopes towards the water and makes for a very testy up and down from either greenside bunker. No bones about it, this hole demands a great tee shot and even better approach shot. 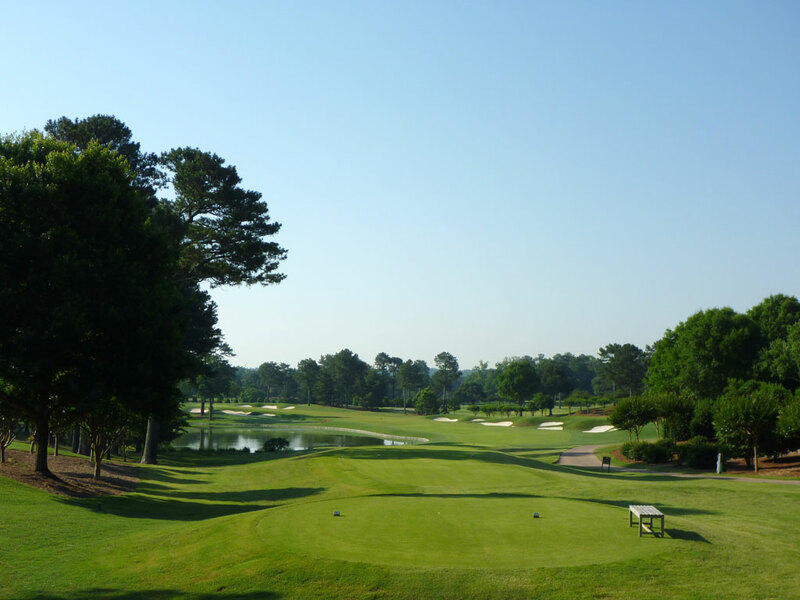 During the 2011 PGA Championship, Atlanta Athletic Club’s finest par four yielded over 50 birdies but also forced seven “others” on scorecards; the second most of any hole on the course. Best Par 5: 12th Hole – 555 Yards – The downhill 12th hole creates a scoring opportunity if you can pound a draw around the corner of this dogleg left; successfully avoiding the collection of bunkers on the right. A pond comes into play 100 yards out and runs up to the right side of the green. A large bunker protects the left side of the green while smaller bunkers protect the rear and far right of the putting surface. The fair sized opening in front of the green welcomes the opportunity to reach this green in two, while the trouble on each side of this approach can open the door to a big number. In the 2011 PGA Championship, this hole yielded more eagle and birdies than any other, but also bit five golfers with "others," the third most among the first 16 holes. Birdie Time: 10th Hole – 436 Yard Par 4 – There was only one non-par-five hole that played to an under par average during the 2011 PGA Championship, and it was the opening hole on the back nine. Most players will elect to hit a 3 wood off the tee to position themselves in the middle of the dogleg and avoid the bunkers awaiting to engulf tee shots that go long. Heading into the green there is a large bunker on the left and safety on the right. A fade around the corner will shorten the hole and leave you with a shorter iron for your approach shot. The green isn't very intimidating and you should be able to take dead aim. This hole also happened to be the only birdie I was able to card during my round. Bogey Beware: 8th Hole – 467 Yard Par 4 – This hole played as the most difficult test on the front nine during the 2011 PGA Championship. If the pros are having that much trouble with it, you know that the common golfer is shaking in their spikes standing on this tee. The entire left side of the hole is protected by a lake with a monster drive required to attempt to carry the corner of this dogleg left. Playing up the safer right side lengthens the hole and features three bunkers outside the short grass. The challenging uphill approach shot features a very lengthy bunker on the left and a second bunker short right of the green. Anything long results in a brutal chance of saving par, especially due to the slick green that you can't afford to be aggressive with. More double bogies were carded on the 8th hole than any other on the front nine during the 2011 PGA Championship.